But this, as the song says, is more than paving paradise and putting up a parking lot. Greenwood, on Adams Avenue near Castor Avenue, has languished in rack and ruin for decades. Dump trucks piled millions of tons of industrial waste onto family plots, burying many under an additional 20 feet of debris. The trade-off for disturbing the eternal rest of nearly 3,000 souls, some of whom have lain in plots for 150 years? The cemetery gets $1.2 million to renovate the crumbling Rush house and restore the grounds to their former glory. The remains, which are being moved at a cost of $3 million, will be reinterred in concrete vaults and topped with a new memorial. The project has been described as a win for both hospital officials and cemetery supporters. Back in the 1930s, when Elizabeth and Ralph Clare were buried at Greenwood, families still gathered there to have picnics and tend to the graves of loved ones. But like scores of historic cemeteries in the region, the grounds fell into decline as the dead were forgotten and families stopped paying for upkeep. Joanne Clare, 57, grew up making regular visits to her grandparents' plot. As the years passed, she watched as the cemetery went to seed. Junked cars were abandoned near her ancestors' graves. Weeds and saplings grew unchecked. Vandals toppled her family's tombstones. Her father struggled with cemetery managers to right them. "He couldn't get them to do anything," Clare said. Clare was horrified when she visited in 2001, she said. "It looked like an overgrown forest with tires, steel-mill slag, and cement chunks littered all over the place," she said. "You could only get back there in the winter, and even then it was like taking your life into your own hands." She joined the Friends of Greenwood, a volunteer organization that maintains the cemetery's records, helps families look up burial sites, and stages periodic cleanups of the grounds, which hold more than 28,000 graves. "I was sick to my stomach and very aggravated on why and how it got this way," said Clare, who became a member of the group's board of directors the next year. In 2005, the Cancer Treatment Centers of America took over vacant Parkview Hospital, next to the cemetery. The cancer center, which opened with 160 employees, expects to have more than 1,000 on staff by 2010. With more employees comes a need for more parking, marketing director John Goodchild said. Long-range plans for the center also include a guesthouse for patients' families and additional clinical buildings, Goodchild said. The only place to expand was into the cemetery. The center's parent company created an affiliate that bought a majority of the cemetery's shares and to which it then paid $1.2 million for nine acres. The parent firm also agreed to cover the cost to move the remains to vaults at the better-preserved northern end of the necropolis. "We've had a handful of cases where cemeteries have been reborn," said Thomas Keels, author of Philadelphia Graveyards and Cemeteries. "This is one of the first cases where a corporation has stepped in and said, 'If we can make this trade, we will help restore the cemetery.' 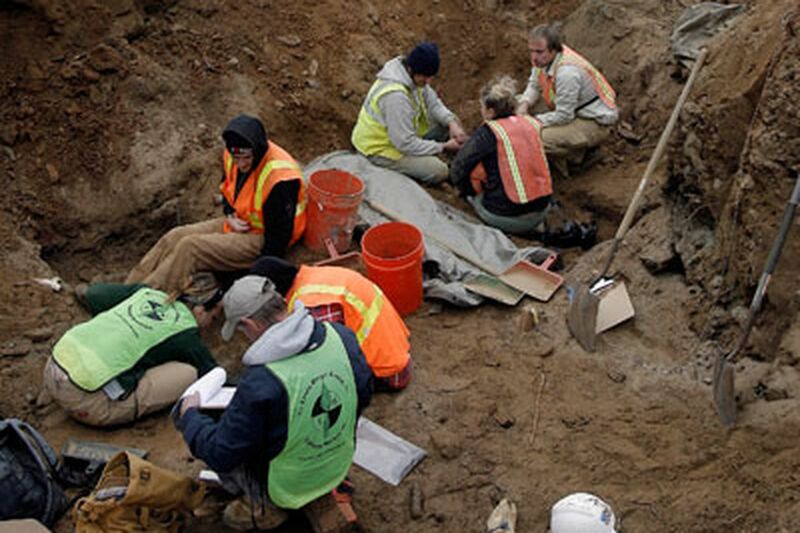 "
The project began in June, and archaeologists started removing remains July 15. Last month, Roderick Brown, principal archaeologist for the Louis Berger Group, ambled down a path littered with broken concrete and black foundry sand. "Six months ago, this was a jungle," he said. "When the project began, there were archaeologists swinging machetes just to clear it." The end of the trail opened onto one of two dig sites at the cemetery's south end. Two archaeologists watched as an excavating machine scraped the earth. "They're looking for soil discolorations that are indicative of a grave," Brown said. Around him, hundreds of pink ribbons fluttered from stakes that marked formerly occupied plots. "We're finding people where they're not supposed to be." Of the 3,000 graves, only 230 had tombstones, Brown said. "Most of the folks just couldn't afford them. That's my guess," he said. "Others had metal markers. Some may have had wooden crosses that just deteriorated." In most cases, the archaeologists have unearthed full skeletons. But some exhumations have been trickier. "If bodies remain under the water table or above it, they're usually well-preserved," Brown said. "Those people buried in an area with a fluctuating water table, going from wet to dry, are completely dissolved." Wooden coffins are rarely in good enough shape to remove intact. "Sometimes all we see is a stain. There's no actual wood there," Brown said. "Very few of the coffins were placed in protective vaults, and some bodies were never placed in coffins." A few people have volunteered to help disinter relatives. Among them was Clare, who in late August helped an archaeologist remove the grandparents she never met. "It was an emotional experience," Clare said. "Before we started, I introduced myself to them and apologized for what we had to do." The remains were moved to a plot in the northern end of the cemetery. "Now," she said, "they're in an area we can visit and honor them."